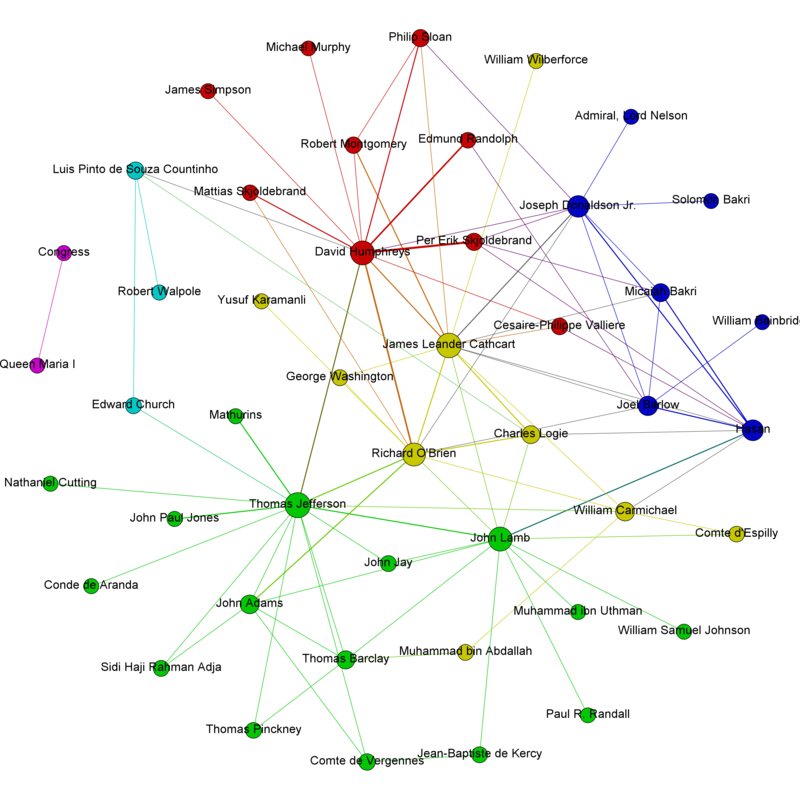 I wrote yesterday about my network graph about U.S.-Barbary diplomatic relations. The graph I showed was color-coded by nationality. That code was hand-inputted by me, no computation or algorithm necessary. A perhaps more interesting, and enigmatic, color-coding is the result of running a modularity algorithm in Gephi. This algorithm creates sub-communities from the large network graph. I will not lie: I do not understand the math behind the result. But the communities created by the algorithm are quite interesting. James Leander Cathcart and Hasan, dey of Algiers, are in two different communities. This is interesting because Cathcart is probably the person with the most access to Hasan in the entire graph. He was an American captive who worked his way up the ranks into Hasan’s household and became a fairly high-ranking official in the court of the dey. I have two theories for why these communities formed this way. (1) Cathcart’s relationship with the dey was largely informal, not something that got memorialized in writing or official documents. Thus, the “paper trail” on their relationship might be thin. (2) Cathcart did talk a lot to the dey. We know that. But it’s possible that his major contributions to the diplomatic situation in Algiers were not his communications with the dey, but his communications with the outside world. Many of the European diplomats who were assisting from the outside fall into the same community, which they share with Thomas Jefferson (then-secretary of state). All, or nearly all, of the people in that community were never in Algiers. It makes sense that they would be placed together. The other interesting person in that community is John Lamb, the first American sent to negotiate with Algiers. I’m wondering whether he is in that community because he had much better success dealing with the Europeans than with the dey.